Ideal Tax Solution, LLC is again identifying ways to strengthen its already well developed personalized customer service platform as demand for professional tax debt resolution services remains constant with a positive forecast for the future. Ideal Tax Solution, LLC continues to extend its marketing and customer service reach to a wider audience of troubled taxpayers as awareness grows in regard to the benefits of working with professional tax relief specialists. As more and more information on professional tax resolution makes its way into the financial services marketplace, individuals and businesses with lingering tax debt liability issues are actively exploring professional tax help companies for quick and effective relief from the IRS debt collection process. Resolving tax liability issues requires considerable time and energy, even if one does have a degree of knowledge about the intricacies of the tax code. Although the rules and regulations governing the collection of taxes are spelled out in expansive fashion, most people cannot afford to utilize their time and energy researching, calculating and eventually negotiating with the IRS to achieve tax debt resolution. 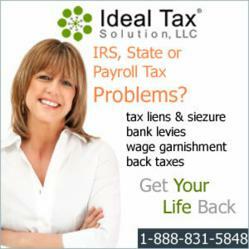 Tax help specialists at companies like Ideal Tax Solution spend their entire workday interacting with the IRS on behalf of clients urgently in need tax debt relief. As in any industry, businesses with increased market exposure experience a greater utilization of their products and services. The tax debt resolution industry is undergoing a rapid transformation from niche financial service status to a much broader developing market which falls under the banner of professional debt liability relief or professional tax debt help. Both of these service headings accurately describe the benefits provided by the professional tax resolution company Ideal Tax Solution. After gathering the energy, documentation and time it takes to effectively deal with an IRS liability collection process, people quickly realize how difficult and all consuming it can be. The Internal Revenue Service expends considerable resources training its agents, and expects them to do their best to retrieve uncollected funds determined to be owed them by individuals they consider to be delinquent taxpayers. Convincing the IRS an individual’s tax liability may not be as great as it appears also requires the expertise of tax help agents who work at companies like Ideal Tax Solution. The power of a professional approach should never be underestimated, especially when dealing with something as important as tax debt. Serious repercussions can result from ignoring or underpaying tax responsibilities. Without the professional touch of tax relief specialists and companies like Ideal Tax Solution, an individual or business risks substantial penalties for not dealing with the IRS in a prepared, knowledgeable and forthright manner.